At GOT IT! Learning Designs, we want you to have excellent learning experiences. We highly recommend incorporating graphic recording maps into your training programs or meetings. Here are some of the reasons why. Did you know that the brain processes visuals 60,000 times faster than it processes text? (Semetko & Scammell, 2012.) That’s amazingly speedy! Here are some more facts substantiating that we humans process visuals better than any other type of data. 65% of people are visual learner (Social Science Research network). When you are communicating information at meetings or training classes, be sure to use visuals that support the content. To truly support the content, you don’t want to just ‘decorate’ the page, but produce images that illustrate concepts or create recognizable analogies. Memorable images are transferred to long term memory and can be recalled up at a later time. It’s great for content retention. Studies have been done to measure learning with text alone versus pairing text and visuals. It was found that learning improved 400% with the support of visuals. (Robert. E. Horn, Stanford University). That’s phenomenal! 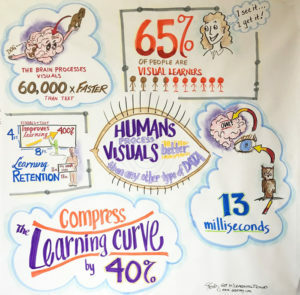 When there is a graphic recorder in your training or meeting room creating visuals to support the learning (for training) or the conversation (for meetings), the experience of watching and seeing creates a memorable and powerful means of impacting memory. Providing multiple modes of receiving information increases learning retention. The large (4 ft. x 8 ft.) graphic recording map is scanned and smaller hard copies are created for each participant. Small scale copies of graphic recording maps are pretty. They get displayed…and guess what! The content is in your face every day, being acknowledged and reviewed after the training or meeting is over. 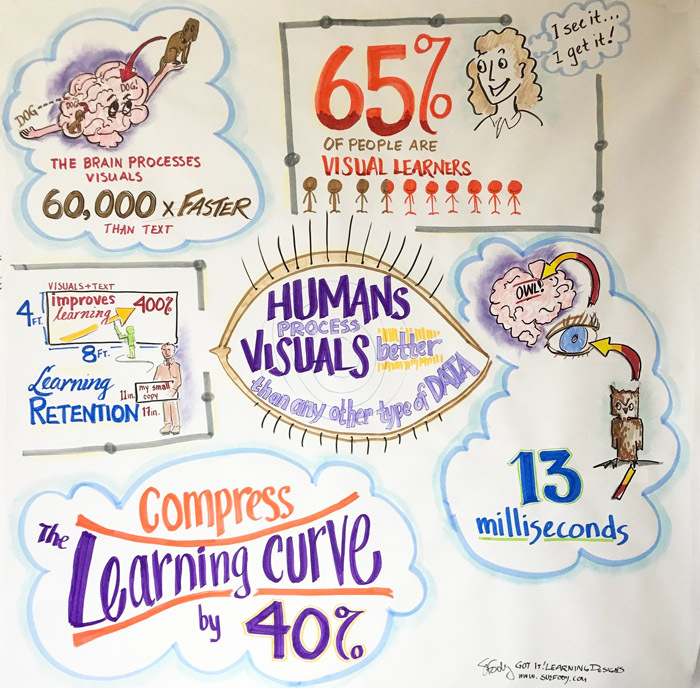 The speed of learning is related to the learning curve, which is compressed by 40% when visuals are effectively supporting learning. People learn faster when they see and hear concepts. (University of PA, Wharton School of Business) Learning more efficiently is a win- win situation for an organization investing time and money into training or meetings. Use your amazing brain and add graphic recording maps to enhance your training and meetings. We graphically illustrate complex concepts like finances, and capture multi-day strategy sessions to communicate the message simply and visually. Contact us if you’d like to see your message clearly!